1) There's a persistent yellow spot in the hamburger top-left. I have no messages outstanding, nor any field notes drafts so I don't know what this is telling me. 2) Accuracy was hit and miss. First cache appeared to be out by about 7m, but I wasn't convinced the coords were accurate to start with. Second cache the app was all over the place, anywhere from 3 to seven metres while I stood still so I fetched my Garmin 62sc, which settled immediately on the right spot. 3) Battery life - awful. I could heat my house on the output from this (well, not quite, but things were definitely warm). My phone generally lasts all day for routine usage. Today I got about three hours. 4) Found caches revert to their posted coordinates. This is just odd. I found myself disbelieving the corrected coordinates for a cache today because they were too close to the posted coordinates for a cache I'd found before. This was until I remembered that the second cache also had its coordinates corrected and had 'reverted' when I found it. Can the display of corrected/posted coordinates be made user-selectable, please? This switch from one to the other when it's found doesn't offer anything. I'd rather the corrected coordinates were displayed at all times. This used to be the case with the web site 'Search' map, while the 'Play' map displayed posted coordinates. With that I could choose which I wanted (but no more, sadly ) I'd like the app to have the choice too. It sounds similar to another recent thread. Sounds like the dot could be appearing because of other reasons (new souvenir, offline lists that are 'out of sync') or it's an API issue. Not sure if this would be related to the app or to your phone. Have you tested GPS accuracy of your phone with other apps? I recently got a newer phone. My older phone had major GPS problems. Maybe it had been dropped one too many times, but even driving directions with Google Maps app were way off. It would tell me to take an exit after I had already passed the exit ramp. Needless to say that it wasn't any better when I used the phone for geocaching. The reverting to posted coords was mentioned in the June 29th Release Notes thread. In that thead, I suggested having a toggle ON/OFF feature for solved coords, because there are valid reasons to see multi/mystery/Wherigo caches at posted coords and also at solved coords. Thanks for your comments, noncentric. After following the thread you referred to it seems the app was trying to tell me about some new souvenirs. Placing a single yellow spot as a flag for several different conditions is not particularly informative. I have a Samsung Galaxy S5. I wouldn't expect a phone to necessarily deliver the performance of a dedicated GPS unit, but I've not seen the vagueness I saw today with GCDroid, or when using it with Google Maps, or, indeed, with the old retired app. The sample size is too small to be definitive so I'll see how it goes. I saw the release notes on 29th June and raised my own comments about corrected coordinates at that time. Having seen it 'working' in the field today I am of the view that switching back and forth between corrected and posted coordinates outside user control is just not helpful. TPTB should consider their philosophy on this. I don't know what the technical hurdles are in providing a user option, but clearly the data is there so hopefully it's not prohibitively difficult. I've been waiting to see the 5.6.2 update, but looks like I'm not one of the guinea pigs part of the small sample that gets the new release first. Once the bugs have been worked out, then I'll be glad to have corrected coords visible on my phone. I like to have offline data on my phone, as a backup, when planning specific caching trips/routes. I'm hoping it won't bother me too much to see the corrected coords without a user setting (or toggle) on the app. On the website, it certainly bothers me to not have a user setting (or toggle) for the corrected coords. I used the previous method of searching vs browsing the map in the past when I wanted to see coords at either the posted or corrected locations. At least I had some type of option then. Now, the only option is to change the found/unfound status of a cache, which isn't really much of an option. It would be great if an ON/OFF toggle was implemented, similar to the DNF option. As an aside, I have an S5 mini. I rarely use it to geocache because it apparently takes an act of Congress to get accuracy better than 50 feet. So the app upgrade may not necessarily be to blame. Recent example: since I don't have our own caches loaded in my GPSr, I tried using the app to get to one of our caches for maintenance after I had trouble remembering where I'd put it. 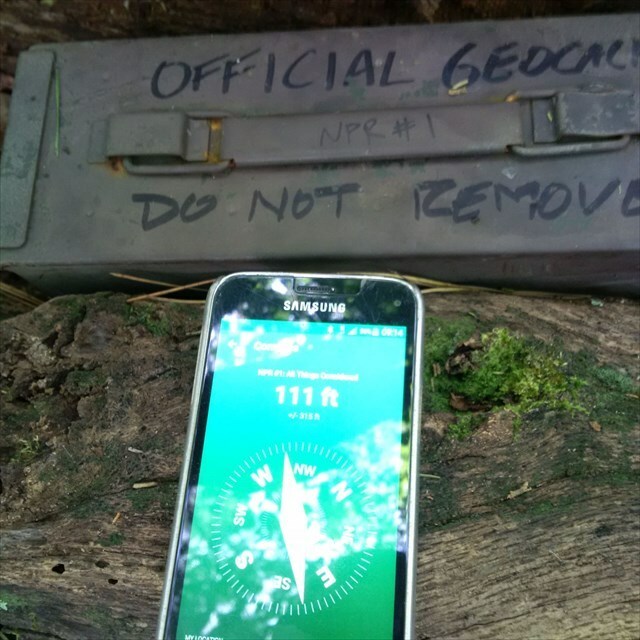 The glare makes for a bad photo, so you have to take my word on it that the EPE is 315 feet, but you can see the phone thinks the cache is 111 feet away. Yeah, I think the best solution would be to have a three-position setting: Always Posted, Always Solved, and Auto (the current behavior). The only time I've seem my phones that far out has been when they were configured not to use GPS, and they were using only cell tower triangulation and wifi networks. And once, when my phone showed my GPS position as being hundreds of miles away. I fiddled with it a while and then gave up and found the cache the old-fashioned way: I found it using what I remembered of the location from the Google satellite images. By the time I was ready to post my field note for finding the cache, the GPS location had fixed itself. I have no idea what was wrong with it that time. Oh, I forgot to mention: That's pretty typical for my phones when I've been using them for geocaching. I once got 5 hours out of one of mine, but I wasn't using it to navigate from cache to cache. I was in a group, and I was piggy-backing on the handheld GPS receivers of the others in the group. I used my phone only to locate each cache at GZ, and to record field notes. I used to think that the GPS antenna used all the power. I have since learned that while the GPS antenna does use a lot of power, there is a secondary effect where the GPS processing prevents the phone CPU from switching to low power mode when you aren't actively using it. The combination of power for the GPS antenna and full power for the CPU is apparently what chews up your battery. Sadly, no. I had that happen once when WhereYouGo was trying to run off cell location only and not GPSr. But it's configured to use GPS. After a couple minutes, my S5 Mini will calm down and start getting accurate within 50-60 feet, but it seldom does much better. This is interesting. I've thought about it and can't figure out a reason to have the "Auto" setting. Not trying to bash your idea, just trying to understand how that would work. Would "Always Posted" show posted coords for all caches, even if those caches have corrected coords? That makes sense to me. Would "Always Solved" show the solved locations for caches with corrected coords, and then would caches without corrected coords be shown at all? This is interesting. I've thought about it and can't figure out a reason to have the "Auto" setting. I doubt that I would use the Auto setting myself. I'd leave it on Always Solved almost all the time, perhaps with occasional uses of Always Posted when I wanted to make sure I wasn't putting the posted coordinates of my cache on top of the bogus posted coordinates of some solved puzzle cache. But IIRC, there were advocates for the current behavior in one of the threads discussing the change. The code is already there to implement the current behavior, and if someone likes it, then it shouldn't be hard to make it available as an option. I see GeoArt. I solve puzzles in the GeoArt - cache location moves to solved location. I find caches in GeoArt - Smiley appears on map, reconstructing the GeoArt as I find each cache. After finding the caches, I have a nice Smiley GeoArt on my map. While perhaps not "useful" in any practical manner, I do enjoy seeing this on my map. I'd like to see the toggle option for both app and website maps, but mostly for the website. I also suspect that it's more feasible on the website than the apps. The toggle option for showing DNF's exists only on the website, not the apps, and that seems fine with me.